Choose one of these colorful birds every day of the week to be your guide. Choose one of these colorful birds every day of the week to be your guide. Each one corresponds to an inspirational word, such as joy, courage, and generosity (a key is included for reference). Keep them where you need a little love, or give them to a friend so they can feel it, too. The decorative leaf-shaped plate keeps your "bird of the day" proudly perched, while the protective box makes for lovely gift-giving and storage. 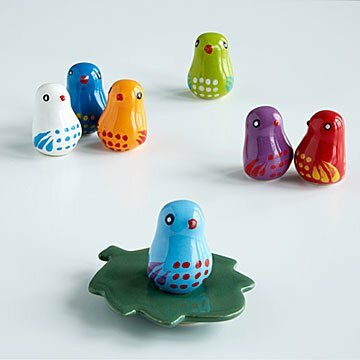 The birds are formed with ceramic molds and then hand-painted by artisans in Mexico. Created by Susan LeVine. Assembled in New York. Did you know we also have Guide Bird Mugs? Choose one of these colorful birds every day of the week to be your guide. Each one corresponds to an inspirational word, such as joy, courage, and generosity (a key is included for reference). Keep them where you need a little love, or give them to a friend so they can feel it, too. The decorative leaf-shaped plate keeps your "bird of the day" proudly perched, while the protective box makes for lovely gift-giving and storage. Alfareria Tradicional's mission is to preserve the manufacturing of handmade majolica pieces in the city of Guanajuato. In this way, they preserve a tradition that the city has had for many centuries. Alfareria Tradicional's starting wage is nearly twice the minimum wage of Mexico. Employees on average earn three times the minimum. All receive vacation time (minimum six days if they have been working for a minimum of one year, and 15 days of Christmas holiday time off). Water used to wash and prepare the clay is recycled. Pieces that did not pass quality control on the bisque before they are fired are recycled. Broken pieces from the bisque are recycled, and some are used to cover gardens or dirt roads. Alfareria Tradicional does not have a charitable giving program, but meet all other Collection criteria. Packaging is meant to store the birds when not in use. There's one place—and only one place—where you'll find Guide Birds: UncommonGoods. I have mine in my kitchen, co-worker has hers in her office, friend has hers on her night side table. They are perfect for anywhere. Loved it so much I purchased one for myself as well. My husband and I love choosing our bird each day. Couldn't be any more perfect than it already is!!! My friend was ecstatic when she received this gift, She said I always find unique gifts. I use these daily with my 5 year old son. He loves picking the bird in the morning and placing it on the leaf. When there are times throughout the day that he needs to refocus his emotions/behavior, I can remind him of the bird he chose, "remember that your guide bird for the day is patience," and he responds so positively! A wonderful reminder to let some things go, and focus on good things in life. I love the guide birds! Love these! Super cute and so easy and helpful to use every day! Bought these as a cute birthday gift for my sister in law who loves inspiration. They are the perfect size for her work from home desk and she loved them! I think I'll even have to buy a set for myself!